The implementation of Electronic Data Interchange (EDI) has helped companies achieve tremendous benefits through the elimination of manual/paper processes. However, many of these same companies are still dealing with a large number of inbound paper documents (i.e., orders, invoices, claims, etc.) to accommodate their small to medium-sized trading partners that are not EDI compliant. Digital Movers has a solution that helps you reduce or eliminate this inbound paper document issue while leveraging your existing investment in EDI. Our Fax Reception to EDI/XML Solution automatically converts information from trading partner's faxes into electronic data and then delivers this data into ERP or other enterprise applications in EDI, XML or proprietary flat files. The result? Your faxed documents are processed just like your electronic ones. 100% Electronic Processing — The ultimate goal of electronic commerce is to achieve 100% electronic processing in order to eliminate the delays, costs and errors associated with manual processing. 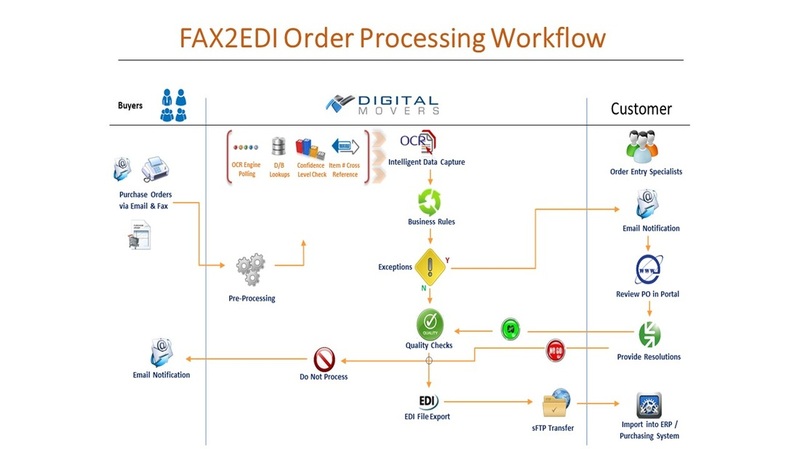 The Fax Reception to EDI Solution enables your trading partners to participate in your electronic commerce program while making little to no changes in their daily processing. Lower Costs — This service can reduce fax reception and handling costs up to 40 - 50% by eliminating the need for conventional fax equipment, manual data entry and paper work flows. No Change for your Trading Partners — Fax Reception to EDI Solution is completely transparent to your trading partners. They continue to fax their documents to you the way they always have (we can even use your existing fax number if you wish). Immediate Financial Impact — Because it is a network service, the Fax Reception to EDI Solution can be deployed quickly with no hardware or software to purchase or maintain and little burden on your IT staff. Convert paper fax documents to EDI or XML. Minimize human intervention and reduce costs.